I have always firmly believed in the concept of six degrees of separation. In other words, if a person is one step away from each person they know and two steps away from each person who is known by the people they know, then everyone is about six steps away from each person on earth. Anyway, when I wrote "A Milestone," I said one of my favorite blogs was written by someone I would never meet, although I would sure like to. Turns out, I have met her; well, maybe not actually met, but we were at the same event. I even have a picture of her, taken by ME! How weird is that? Okay, here's the scoop. She was a college roommate of my niece, Becky, although I only found that out recently, and long after I became a big fan of her blog. 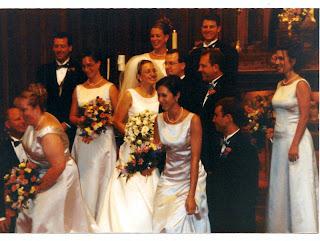 She was a bridesmaid in Becky's wedding in Elmhurst, Illinois. Mark and I were at the wedding. I took a candid shot of all the bridemaids as they were coming off the church platform after they had taken their formal picture with the photographer, and there she is, just to the right of the bride: So maybe/probably we didn't actually meet. But we were at the same wedding and wedding reception. And now nine years later, we are reading each other's blogs. How cool is that? I guarantee you I am no longer that thin. That's really cool! But how did you figure it out? My color is "shaded blue"